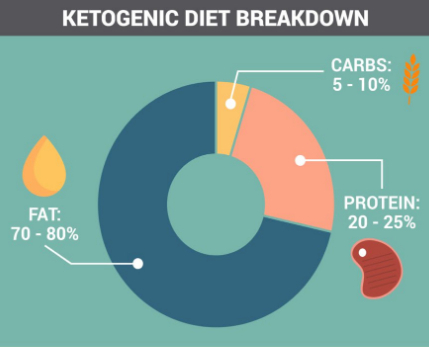 The keto diet, as a rule, is a very low in carb, high fat and moderate protein diet. When following a ketogenic diet, carbs are typically reduced to under 50 grams per day, which for most people is a significant drop. Fats should replace the majority of the cut carbs and deliver approximately 75% of your total calorie intake. Though fat is often avoided for its high calorie content, research shows that ketogenic diets are significantly more effective at promoting weight loss than low-fat diets. Plus, keto diets reduce hunger and increase satiety, which can be particularly helpful when trying to lose weight. SUMMARY: The ketogenic diet relies on a very low-carb routine. Carbs are typically restricted to under 50 grams per day, replaced mostly with fat and moderate amounts of protein. Eggs: organic whole eggs make the best choice. Meat: Grass-fed beef, venison, pork, organ meats and kangaroo. Full-fat dairy: organic yogurt, butter and cream. Condiments: Sea salt, pepper, vinegar, lemon juice, fresh herbs and spices. Unhealthy fats: Margarine, vegetable oils such as canola and corn oil. Spring Water: Water is the best choice for hydration and should be consumed throughout the day. Unsweetened coffee: Try a “bulletproof coffee” for something fun and different. For enjoyers of alcohol, a low-carb drink like vodka mixed with soda water with fresh lemon or lime is a good option. SUMMARY: A healthy ketogenic diet should revolve around high-fat, low-carb food choices and restrict highly processed items and unhealthy fats. Keto-friendly beverage options must be sugar-free. Consider water, sparkling water or unsweetened green tea and coffee. Breakfast: Two eggs fried in organic butter served with sauteed greens. Breakfast: Capsicum stuffed with cheese and eggs. Lunch: Rocket salad with hard-boiled eggs, turkey, avocado and blue cheese. Dinner: Kangaroo sausages with cheesy broccoli. Although many ketogenic meals are based around animal products like the one above, it can be done as a vegetarian as well. SUMMARY: A ketogenic meal plan, like any healthy diet, should include whole foods and many fiber-rich, low-carb vegetables. Choose healthy fats like coconut oil, avocado, olive oil and organic butter to increase the fat content of dishes. If you’re unsure how many calories you should be eating, use a BMR (Basal Metabolic Rate) calculator online to calculate energy needs. SUMMARY: Keto-friendly snacks should be high in fat, moderate in protein and low in carbs. Increase your fiber intake by snacking on sliced, low-carb vegetables with a high-fat dipping sauce. Meat and poultry: Beef, chicken, turkey, kangaroo and pork (choose organic, pasture-raised options whenever possible). Shellfish: Oysters, prawns and scallops. Eggs: Always purchase ethical, organic, free-range eggs. Full-fat organic dairy: Unsweetened yogurt, butter, cream and sour cream. Condiments: Sea salt, pepper, salsa, herbs, garlic, vinegar, chilli, mustard, olives and spices. SUMMARY: Preparing a shopping list can help you decide what foods will fit into your ketogenic meal plan. Fill your cart with meat, poultry, eggs, low-carb veggies, full-fat dairy and healthy fats. Focus on high-fat, low-carb foods like eggs, meats, dairy and low-carb vegetables, as well as sugar-free beverages, all as local, organic and ethical as possible. Be sure to restrict highly processed items and unhealthy fats. Using this plan as a guide to get started on the keto diet can set you up for success and make transitioning to a high-fat, low-carb diet a breeze.